My friends at The Labyrinth Book Store asked me to contribute a piece to their Iron Giant Project. Anything goes, as long as it somehow relates to the film. I decided to pretend like the events of the film actually happened, and this is a vintage photograph signed by an adult Hogarth Hughes. REally nice!!!! awesome......I like more,,,,,,,,,,,, good work !!!!!!! aw man- that's awesome, marco! Like the texture and ambient! need standard cam on horizon level. It´s so cute Marco , I did´nt see your blog a long time ago. .And I can see that you like matte-painter lately. 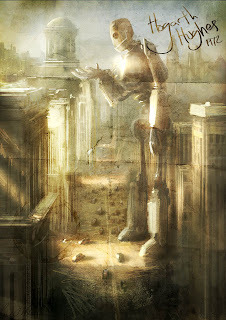 .Can Anyone to send a work to :http://irongiantproject.blogspot.com/??? Great mood and lighting in this piece. Man, I really liked your submission for iron giant project! Prints for Sale at Little City!